Our ‘blue-chip’ clients have the choice of the World’s leading training organisations. The fact they have chosen our expertise is, we believe, a testimony to our abilities. We have been training providers for 30 years, presenting literally hundreds of courses. The courses detailed in our training directory are an indication of our range in the broad area of commercial management, purchasing and contracts. Whatever needs are identified we can provide a world class resource. Our greatest skill lies in developing tailored courses to meet real business needs. We have recently trained 75 contract managers in a power station, preparing them to manage an outage situation as well as operational situations. 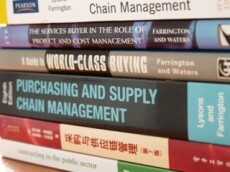 Our tutors are seasoned procurement consultants with strong academic qualifications including PhD, MBA, MSc and MCIPS. They are able to call on strategic and operational experience to make the events real life. It is vital that training and development is directly linked to the organisational strategy and supportive of the personal development of the organisation’s employees. 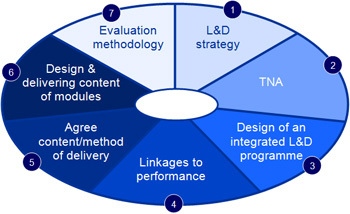 Our proposition for procurement and supply chain management learning and development is detailed in the diagram below. 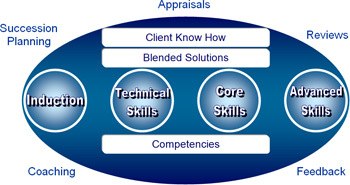 We can provide individual elements of, or indeed all of, the elements of the ‘development wheel’. All our courses can be delivered individually or as part of a programme to any level on management. Our courses are client driven – the content of any course or programme will be tailored to meet the client’s needs and to fit with their environment including the time available to dedicate to the activity. This all begs the question – what can our clients and participants expect? The client will get a motivated and inspired team, intent upon delivering high quality procurement and supply chain services. The deliverables will come in many forms and will include cost reduction, higher quality services, improved use of working capital and improvements required by the corporate strategy. The participants can relax in the knowledge that they have the latest techniques and skills and have the ability to apply them in their specific situations. There literally is no boundary to our potential learning and development contribution. Recent events have included a briefing on DEFCONS to a defence contractor, commercial project management skills, negotiations skills, contract management skills, price and cost analysis, supplier relationship management, outsourcing, partnering and contractual risk management. We ideally want a relationship with your management, learning and development specialists and procurement and supply chain specialists. That will ensure maximum results. Learning and Development focussed on procurement change matters is a high level skill, acquired through national and international experience at the highest level, and in challenging environments. Brian Farrington is no stranger to implementing change motivated by strategy direction and accompanied cost pressures. Above all, your people must respect the people delivering the learning and development. Our ability to gain this respect sets Brian Farrington apart from competitors who often operate in a narrow constrained business specialism. The Brian Farrington longevity, technical achievement, worldwide experience and track record are proof of our abilities. For a copy of the Brian Farrington Directory 2016 please email Ray Gambell.